Compliments to our winemaker for this traditional, blackberries and dark fruit combo. With notes of cigar box and pencil shavings, this aromatic beauty hints at a pairing of a crown of roast lamb with rosemary and oregano. Bon Appetit. 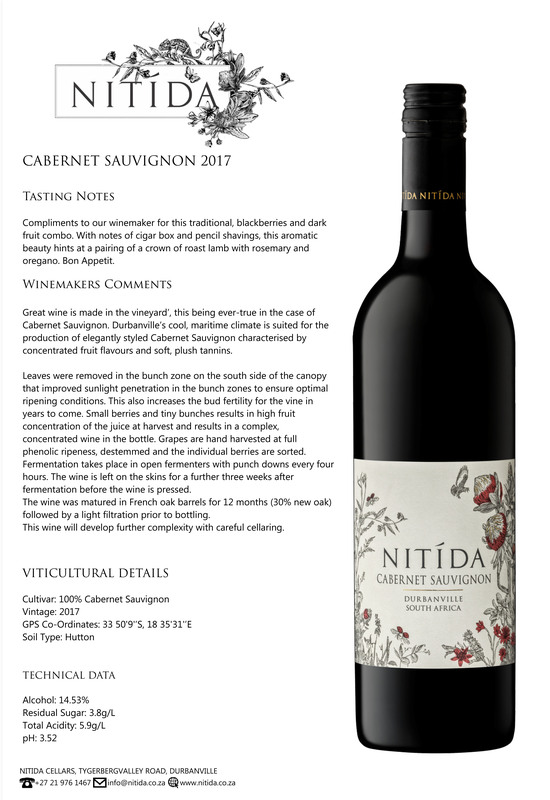 Great wine is made in the vineyard’, this being ever-true in the case of Cabernet Sauvignon. Durbanville’s cool, maritime climate is suited for the production of elegantly styled Cabernet Sauvignon characterised by concentrated fruit flavours and soft, plush tannins. Leaves were removed in the bunch zone on the south side of the canopy that improved sunlight penetration in the bunch zones to ensure optimal ripening conditions. This also increases the bud fertility for the vine in years to come. Small berries and tiny bunches results in high fruit concentration of the juice at harvest and results in a complex, concentrated wine in the bottle. Grapes are hand harvested at full phenolic ripeness, destemmed and the individual berries are sorted. Fermentation takes place in open fermenters with punch downs every four hours. The wine is left on the skins for a further three weeks after fermentation before the wine is pressed. The wine was matured in French oak barrels for 12 months (30% new oak) followed by a light filtration prior to bottling. This wine will develop further complexity with careful cellaring.